For other people named John Williams, see John Williams (disambiguation). Dial M for Murder (1954). L-R: Ray Milland, Robert Cummings and John Williams. John Williams (15 April 1903 – 5 May 1983)[Note 1] was an English stage, film and television actor. He is remembered for his role as Chief Inspector Hubbard in Alfred Hitchcock's Dial M For Murder, as the chauffeur in Sabrina, and as portraying the second "Mr. French" on TV's Family Affair. Born in Chalfont St Giles in Buckinghamshire, England, in 1903, Williams was educated at Lancing College. He began his acting career on the English stage in 1916, appearing in Peter Pan, The Ruined Lady, and The Fake. In 1924 he moved to New York, where he was cast in a series of successful Broadway productions. He would appear in over 30 Broadway plays over the next four decades, performing on stage with many notable performers, such as Claudette Colbert in A Kiss in the Taxi 1925, with Helen Hayes in Alice Sit by the Fire in 1946, and with Gertrude Lawrence in Pygmalion in 1946. In 1953, Williams won a Tony Award for Best Supporting or Featured Actor (Dramatic) for his role as Chief Inspector Hubbard in Dial M for Murder on Broadway. Later, when Alfred Hitchcock adapted the play to film in 1954, he cast Williams in the same role. Williams reprised his Broadway role in Dial M for Murder for a 1958 Hallmark Hall of Fame television presentation. Also pictured are Maurice Evans and Rosemary Harris. Williams first appearance in a Hollywood film was in director Mack Sennett's The Chumps in 1930, ultimately appearing in more than 40 films. Two other examples are Hitchcock's The Paradine Case starring Gregory Peck, in which Williams portrays a barrister, and To Catch a Thief (1955) with Cary Grant and Grace Kelly, in which his character is an insurance company representative. Williams made more than 40 guest appearances on television shows as well. He played in several episodes of Alfred Hitchcock Presents including "The Long Shot" (1955), "Back for Christmas" (1956), "Whodunit" (1956), "Wet Saturday" (1956), "The Rose Garden" (1956), the three-part episode "I Killed the Count" (1957), "The Three Dreams of Mr.Findlater" (1957), and "Banquo’s Chair" (1959). Three of these episodes, "Back for Christmas", "Wet Saturday", and "Banquo’s Chair", were directed by Hitchcock himself. 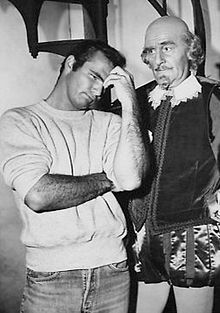 In 1963, Williams played William Shakespeare in The Twilight Zone episode "The Bard". That same year he also guest-starred on the sitcom My Three Sons, portraying a stuffy, very precise English butler; and in that role he was clean shaven, not sporting his customary mustache. Later he was part of the regular cast for the 1967 season of the family comedy Family Affair. He appeared as well on Night Gallery in the series' 1971 episode "The Doll". One of Williams' last performances was in 1979, playing alongside fellow actor Lorne Greene in a two-part episode of Battlestar Galactica titled "War of the Gods". Williams died at the age of 80 on 5 May 1983, in La Jolla, California. It was reported at the time of his death that he had been suffering from a heart condition. He was cremated and there was no funeral. Will Success Spoil Rock Hunter? (1957) – Irving La Salle Jr.
Family Affair, as Nigel "Niles" French. 9 episodes. Replaced Sebastian Cabot (Mr. French) while he was recovering from an injury to his wrist. This page is based on the Wikipedia article John Williams (actor); it is used under the Creative Commons Attribution-ShareAlike 3.0 Unported License (CC-BY-SA). You may redistribute it, verbatim or modified, providing that you comply with the terms of the CC-BY-SA.